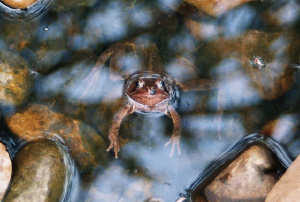 Observation - Frog in garden pool - UK and Ireland. Description: A common frog which was regularly seen in the tiny pebble pool at our old house - certainly appeared to be the same individual. A common frog which was regularly seen in the tiny pebble pool at our old house - certainly appeared to be the same individual.